(CNN) - Seventy-five-year-old Delores Marotta used her cane to hobble into a metro Detroit gas station. She asked the attendant to put $3 on pump number three. 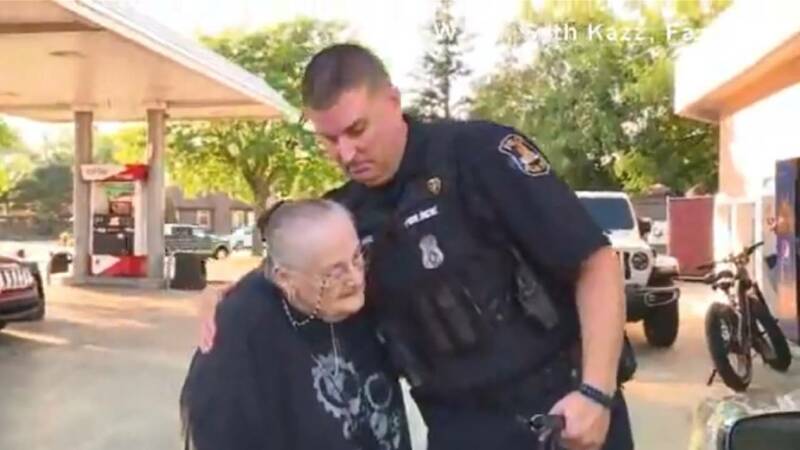 A St. Clair Shores, Michigan, police officer overheard her request and surprised her by adding an extra 20 bucks of gas to her tank. On Aug. 31, Officer Todd Bing watched Marotta use a couple of crumpled up dollar bills and some quarters to pay for less than a gallon of gas. "She was so slow-moving that I was like 'I'm going to go pump this gas for her,'" said Bing. Marotta said she only had $3 until she received her next Social Security check and needed just enough gas to get to and from a doctor's appointment. The two began to talk, and Marotta shared that her husband, James, had passed away in 2015, and explained how she's been struggling to pay her property taxes, buy groceries and put gas in the car her daughter gave her. During the chat, Bing continued to pump. "It seemed like he was putting in a lot of gas, because I only told him $3," Marotta told CNN affiliate WXYZ-TV. "It was just the right thing to do. Officers do this kind of thing all of the time," Bing told CNN. When Bing went into the gas station to pay for the extra gas, he discovered the moment had been captured in a photo by the gas station's owner, Seth Kasyouhanan. "He's like 'Dude I took a picture of you. I'm putting this on Facebook,'" Bing said. Kasyouhanan said he decided to capture the moment in hopes it would give people some good news. "I just kind of wanted to show something a little more positive," he said. Kasyouhanan said Marotta often comes into the station with loose change to pay for small amounts of gasoline. "I thought to myself, what if that was my mother and I wasn't around to support my mom?" he said. Kasyouhanan himself is known around the community for helping his customers who face financial struggles. He said after sharing the post, he received about a thousand messages from people who wanted to drop off or send money to help Marotta. "I didn't think that everyone ought to come in and give me cash, so I thought the only way this would work would be to make a GoFundMe account," Kasyouhanan said. While Bing has shied away from the attention of the viral post, he is proud of the light this has shined on the good things police officers do in their community. "It is a good example to show people how we help each other." Marotta sees Bing as the shining light in her life. "God must have sent him there for me," she said. Marotta is eternally grateful for the support. When told by CNN the latest amount raised for her from GoFundMe, she was shocked. "I appreciate everything, and I want people to know how really grateful I am for the help. "When my husband and I were younger, we would help people as much as we could. So if you see somebody or know somebody who is having a hard time, help if you are able to do it."